Named in honour of the much-loved Queen, 'Victoria' Plum is the UK's favourite plum variety by a mile and deservedly so! The delicious fruits are ready to pick year late in the summer and taste simply mouth-watering when eaten straight from the tree. With the remaining fruit you can make jams and preserves and of course, eat them stewed with custard! Having been discovered in Alderton, Sussex in 1844 and grown and enjoyed by gardeners every year since, 'Victoria' really has stood the test of time - undoubtedly because of its sublime flavour and productivity - a fully established tree of this 'self-fertile' variety will produce up to 100lbs of fruit in a bumper season! Supplied on a 'dwarfing' rootstock. Fruits are ready to pick each July and taste simply mouth-watering straight from the tree. 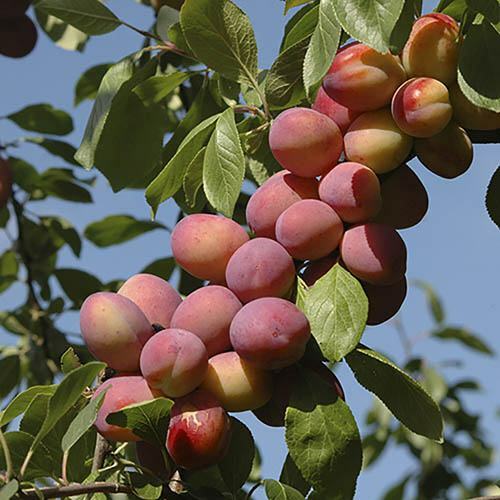 A fully established tree of this self-fertile variety will produce up to 100lbs of fruit in a bumper season! I just had to tell you that I bought a Victoria plum tree and a sweet cherry tree earlier in the year. Both arrived in wonderful condition, spent some time in a bucket having a good drink as recommended, then planted. I was fascinated to see blossom appear on both trees. Considering they were young dwarf stock I hardly expected to see that. I expected they would spend their first few years putting down roots. I have just eaten the first plum of 6 my little tree produced. Oh my, what flavour, what sweetness! It truly stopped me in my tracks. Anyway I thought I just had to tell you what joy my little tree has brought. Thank you. A very satisfied customer! See photo opposite - thanks Julie! Supplied as a 1.2m tall, grower quality, multi-branched 'bare root' tree. Grown on a dwarfing root stock. Will grow to approx. 2m (6-7 ft) in 10 years. Fully winter hardy. Self fertile.